If the passionate conservationists who make up AWF’s Conservation Management Training Program (CMTP) are the future of conservation, then Africa is in good hands. Kenya’s Robina Abuya, Sylvia Wasige and Eric Reson; Cameroon’s Muyang Achah and Hendriatha Che; and Nigeria’s Elizabeth Babalola started in July 2014 as the newest class of AWF’s rigorous mentoring program for African conservationists. Below, some of the new trainees, along with trainees Sarah Chiles and Edwin Tambara from the previous class, discussed their outlook on conservation. What prompted you to choose a career in conservation? Sylvia: When I was growing up I’d see the Kenya Wildlife Service rangers all dressed up in jungle outfits—[laughter]—and that was something for me! At university, I [pursued a degree in] wildlife management. My uncle said to me, “Wildlife, what is there to manage?” Because I come from Bungoma, where actually there’s no wildlife left. I felt, if this is my uncle and he has that kind of view about wildlife, what about other people who’ve not had a chance to experience it? That’s where I got the passion. Is it unreasonable to expect struggling local communities to prioritize wildlife protection? Sarah: My sense is that communities are not anti-wildlife conservation per se. It’s really that things like overpopulation and [human] migration have affected the way communities are structured. Amongst the Maasai, for instance, there was a communal sense of ownership around cattle. Now there’s more of an independent sense of ownership, so now each man would like cattle. And that has a number of consequences. How do we address that? Sarah: This is a challenge for conservation, where we ultimately have to be engaged in cultural change. And that’s a politically sensitive thing, really. Edwin: As much as we want to bring back some of the good cultural practices, we also have to think about the economic aspects. We’re looking at population increase, competing land-use practices. For example, when we are planning, it’s not only a case of blocking out areas to say, “This is strictly for conservation.” We have to really consider all those other competing land-use practices as well. But the best way we can go about it is—we have a saying in my country, “Knowledge troubles.” If you have knowledge about something, then you’ll be troubled [and do something about it]. We need to educate people, to trouble them. For example, vultures, which I conducted my masters research on, are known to clear up to 70 percent of carcasses that can potentially cause disease in their environment. If you teach people about the importance of this species in that environment and the risk of losing this species, then they’ll have that knowledge. They’ll become troubled and will feel the need to conserve that species. Sarah: I’ve picked up that we’re all invested, in different ways, in environmental education for the new generation, even though we’re still a young generation. Because at the rate that things are changing, we need to already be seen as leaders and be training the ones below us. Instilling that kind of knowledge can create change. The only problem in conservation is that we can’t necessarily see that change in the short term. Elizabeth: It’s about providing incentives—not just financial incentives, but everyday incentives for people to be invested in what we refer to as conservation. But then the next step is empowering the young generation to feel like they can actually cause change. For the new guys here, what are you hoping to get from CMTP? Elizabeth: I am hoping for an Africa wide experience. I really want to learn what is working and what isn’t working in other African countries. Robina: You experience barriers in topic areas where you’ve trained. So I’m hoping to uninstall—[laughter]—what I already have in my hard drive and install new information. Eric: I expect to learn from the experts at AWF. These are the people who have worked for a long time in conservation. They have a history of what works and what doesn’t work. So as a young person who’s coming up in conservation, I’m really looking forward to learning a lot from them and trying to question why some things that were introduced by earlier conservationists didn’t work, and trying to see if conservation is changing with modernization. Sylvia: So far, most of my life has only been academic—I know things on paper. Now I really want an opportunity to see [what I’ve learned] in practice. From the old CMTP guys, any words of wisdom or advice for the new class? Edwin: CMTP is quite an opportunity. As you say, Eric, you are interacting with people who are at the highest levels in conservation. You get to hear about where the future of conservation is going. Sometimes, they might be throwing you into the deep end because they will have recognized your capabilities. So you’ll get tested. 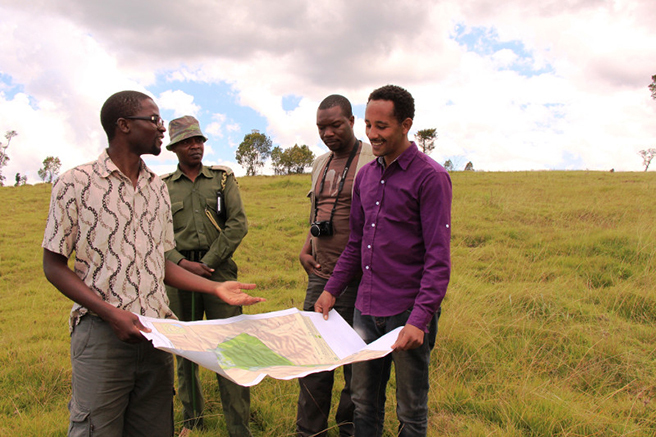 But, I’m already in a position where I can influence conservation decisions in South Sudan, in Uganda, in Tanzania. I don’t think many people have that opportunity to be able to contribute to conservation at that level so early in their career. An excerpt of this discussion also appeared in AWF’s 2014 annual report. If you're an aspiring conservationist, you have until March 15 to apply for the CMTP.